Oh Northern California, how I miss you so! Even if the sun didn’t shine when I visited you, at least you gave me lots and lots of room to run and go wild! Ah, the memories. Where are you guys hanging out now? Will you be coming to the Seattle Tripawds get together? Looking good! I want to run on the beach with you! Hello, Wyatt human friends, my name is Sean, I may well be wanting to adopt a tripawed friend especially if one wants a job, I’m thinking a brave shep like you, you see recently I lost my guide partner to a condition i didn’t know some breeds could get, but I look at it this way, she’s in a better place now and did her job well that’s what counts. If her school fails in a new match its likely I will give a Shepard tri a second chance at a job, not as a guide, but as a helper. Can your humans please send me a contact source they might know useful in Seattle area deemed good to go through? There are some I won’t risk, either they’re inactive or the site might be fake and I prefer to stay with sources legitimate like rescue types proven helpful, tripawed or not, a German Shepard deserves to have something to do. Please let me know, and keep pawing. Awww Sean I’m sorry your girldog is an angel now. I know the right helper will come along. 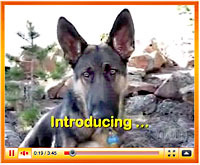 Have you tried contacting the local German Shepherd Rescue organization? I don’t know who is near you but you could try contacting the peeps who rescued me, German Shepherd Rescue of Northern California and ask them for referrals. Good luck to you both, that will be one lucky dawg to have you as a human best friend.